A crowd of students, enrolled in the Boys and Girls Club of Santa Ana summer program, lean in around my colleague to examine the creature in question. 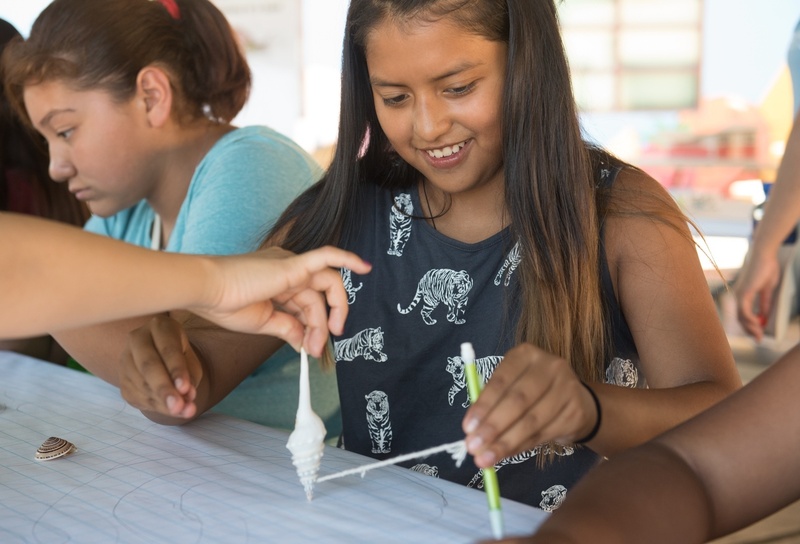 Thanks to our partner Chevron, MIND Research Institute brought interactive mathematical experiences like "Math and Nature" to the Boys and Girls Club students. Other sessions during the four-day program featured "Math and Movement," "Fun and Games," and "Ropes Course." As you can already judge by the titles, this is not like your ordinary math class! One of the big differences lay in the great math questions students asked, including “Why are the distances between the circles different?”, “Where do I start to make a spiral?” Questions like this show us that deeper thinking is happening, and my colleagues are constantly trying new ways to encourage this type of mathematical thinking. Students map out the spirals found on shells to explore the math. One activity in Math and Nature asks the the group to physically embody the 360 degrees of a circle. Students toss a ball and shout out the degree of their target, who has to catch the ball. Switching things up by asking students to move 30 degrees clockwise, or to create an equation where the answer is the target, keeps the students thinking and engaged. We’ve talked before about the learning benefits of creating a connection between the mind and body, and the environment of summer camp is a chance to take advantage of the urge to move and play! Students play a game to explore the 360 degrees of a circle. When Jose Delgado started as the Director of 21st Century Programming at Boys and Girls Club of Santa Ana, one of the challenges he faced was balancing the content between literacy and math, and between the different STEM fields. For the summer, Jose coordinated programming for everything from coding to debate, from music to astronomy. And now, working with MIND Research Institute, math programming that gets students on their feet and actively engaged in exploring math. Jose is excited to continue working with MIND to pilot programming that we can expand to Boys and Girls Club of Central Orange Coast and beyond. MathMINDs programming is also being piloted this summer at Girls Inc. of Orange County, thanks to our partner Chevron! 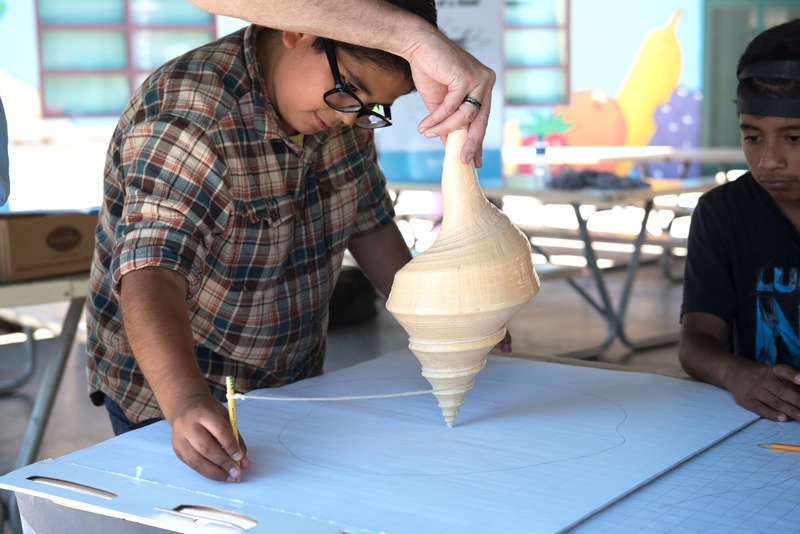 Santa Ana student Michael demonstrates how to transcribe a spiral from a giant shell. Interested in becoming part of the MathMINDs community? Reach out to me @magucervantes1, mcervantes@mindresearch.org or sign up below! Maria Cervantes is a Community Partnerships Director at MIND Research Institute. Find her on Twitter @magucervantes1. Video: What’s the Deal with Aunt Sally? Why We Should Worry Less About The "Achievement Gap"